Alaska’s mountains are known to impress. They span a wide range of terrain and offer spectacular features like active volcanoes and picturesque glaciers—more than enough visually breathtaking options to satisfy even the most well-traveled and experienced landscape photographer. Don’t forget about Denali, the highest peak in North America. But in addition to The Great One and the countless other mountains in the state, here are four of Alaska’s major ranges worth knowing about. The Brooks Range is known as the northern extension of the Rockies and “north” is key. The 600-mile range sits entirely above the Arctic Circle. It’s also home to the Arctic National Wildlife Refuge, vast, pristine wilderness where polar bears, caribou and musk oxen roam. The Endicott Mountains, Kobuk Valley National Park in the Baird Mountains and Noatak National Preserve all lie within the Brooks Range. Alaska’s history is rich with tales of gold prospectors trekking north in search of fortune; adventures that often led them through the Brooks Range. During the 1880s and 1890s, Navy and Revenue Marine Service helped chart the river systems that weaved through the mountains. Six U.S. Geological Survey expeditions followed, with teams that traversed the mountain range, mapping features that would later counter some of the inaccurate gold rush literature that was luring prospectors and miners to danger or disappointment. The Alaska Range is perhaps most famous for Denali and Denali National Park and Preserve. With an elevation of more than 20,000 feet, Denali is the highest peak in all of North America, recently making headlines when President Barack Obama officially renamed the former Mount McKinley to its Alaska Native name of Denali. The range also boasts Mount Foraker—17,400 feet—and the third-highest mountain in the U.S. The Alaska Range attracts climbers seeking a challenge as well as locals and visitors in awe of dramatic mountain scenery and the range’s epic glaciers. The Wrangell Mountains form the heart of America’s largest national park, Wrangell-St. Elias. The Wrangell Volcanic Field covers more than 2,000 square miles and includes thousands of lava flows and Mount Wrangell, one of the largest active volcanoes in the world. Before you enter the park, check in at the Copper Center Visitor Center Complex, in Copper Center, Alaska. Here, you can plan your trip with the help of park rangers, visit the bookstore, exhibit hall, theater and the Ahtna Cultural Center, all while enjoying the landscape from scenic overlooks. Book a stay at the Copper River Princess Wilderness Lodge, conveniently located right on the edge of the preserve and just a couple of miles from Copper Center. From here, you can take in spectacular mountain views even before you step foot into the park. Much of the Aleutian Range is volcanic which makes this one of the more “exciting” of Alaska’s mountain ranges. The Aleutian Range is also the longest, stretching more than 1,000 miles west from Cook Inlet to the end of the Aleutian Islands. Volcano eruptions are not uncommon. Some of these are recent, including Mount Redoubt, the most active volcano in the range, which had its latest large eruption a few years ago, blanketing communities as far as Anchorage in volcanic ash. Mount Iliamna is also an active volcano in the range. 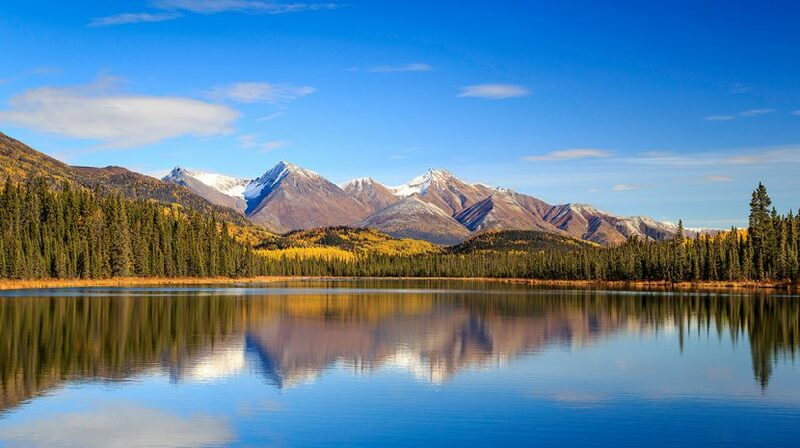 It sits within Lake Clark National Park and Preserve and is covered in glaciers that feed a number of lakes nearby, including Lake Iliamna, the largest lake in the entire state. Based on legend and tall tales by locals, Lake Iliamna is rumored to have its own monster lurking in its deep waters. The lake was even featured on the show “River Monsters,” on Animal Planet. While many Alaskans swear there is something eerie beneath the surface, some scientists believe it may actually be a Pacific sleeper shark. It may be worth a trip out there to see for yourself!